But the acting chief electoral officer suggests it's too late for 2019. President of the Treasury Board Scott Brison, acting minister of democratic reform, arrives for a press conference on efforts to modernize Canada's federal elections in Ottawa on April 30, 2018. OTTAWA — The federal Liberal government wants to make it easier for Canadians to cast a ballot, while making it harder for political parties — or foreign entities — to violate their privacy or persuade them who to vote for using falsehoods or vast sums of money. 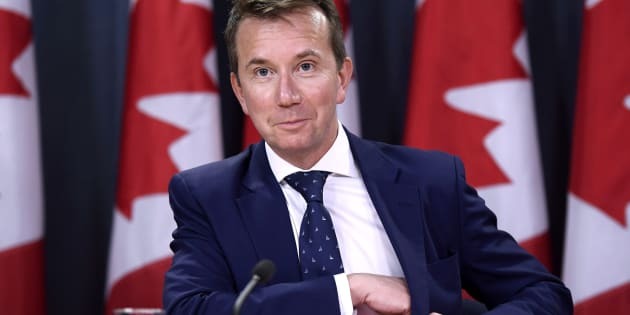 "We are committed to maintaining the trust of Canadians in our democratic process,'' Treasury Board President Scott Brison, who is acting as democratic institutions minister while Karina Gould is on maternity leave, said Monday. Brison introduced legislation Monday meant to address several promises Prime Minister Justin Trudeau made in 2015, including by tackling how much political parties and third-party advocacy groups can spend before and during election campaigns. It is also meant to buttress the Canadian electoral system against new threats to democracy by reining in the proliferation of so-called fake news and barring any organizations, including social media sites, from knowingly selling election advertising bought with foreign funds. People exit a voting station on election day in Calgary, Alta. on Oct. 19, 2015. The proposed measures include forbidding the spreading of materials, whether on paper or online, designed to mislead Canadians about their source. "Canada is not immune to threats from foreign influence and online disruption,'' Brison said. The proposed legislation, if passed, would also introduce a limit on how much political parties can spend on partisan advertising leading up to the official campaign period, which would be about $1.5 million in 2019. There is currently no cap on the amount of money political parties can spend at that time. Third-party advocacy groups, meanwhile, would be limited to spending $10,000 per electoral district — up to $1 million in total — on partisan advertising, activities and election-related surveys. After the writs are dropped, however, those third parties would be able to spend up to $500,000 in 2019. That's more than is currently allowed, but it would cover a wider range of activities and none of it could come from foreign entities. Bill C-76 would also give the federal elections commissioner greater investigative powers. Brison said that, coupled with the $7.1 million over five years in the 2018 budget, would help the watchdog improve the ability to respond, even in real time. Still, Brison acknowledged the proposed changes to the Canada Elections Act cannot be the only solution and that the federal government would continue to work with other countries to boost cybersecurity. "This is inherently a global issue,'' Brison said. The bill would also push political parties to be more proactive about online privacy, an issue that hit close to home this spring when Facebook acknowledged the data of more than 620,000 Canadians was likely shared improperly with political consulting company Cambridge Analytica. The proposed legislation would require all political parties to create and publish a policy on how they will protect the privacy of voters, including what information they are collecting from potential voters, how it will be safeguarded and how it will be used. They would also have to designate someone to handle privacy complaints, but there would be no actual consequences for violations. Bill C-76 also contains measures to make voting easier, including by allowing someone with a disability to vote at home, and having advance polls remain open for 12 hours in an effort to reduce wait times. It would also create a registry of Canadians between the ages of 14 to 17 who would be allowed to vote within the next few years. The proposed legislation also includes measures to make it easier for those with caregiving responsibilities to run for federal political office, by reimbursing candidates 90 per cent of the cost of daycare, home care or other health-care services for their family members, and not have it count towards the campaign spending limit. The Liberal government introduced some reforms in November 2016, aimed at undoing some of what the Conservatives introduced through their Fair Elections Act — including restoring the use of the voter identification card as a valid piece of ID. It would also repeal the ban on voting by expat Canadians who have been away from the country for longer than five years. That bill, stalled at the introductory stage ever since, will be rolled into the new one. The legislation does not, however, come through on the promise to create an independent commission to organize televised debates among party leaders, even though the 2018 federal budget commits $6 million over two years to support a new process for the exercise. Meanwhile, acting chief electoral office Stephane Perrault has cast doubt on the ability to implement any major reforms in time for the next election, telling a House of Commons committee last week that anything meant to apply in 2019 should have been in place by now. Brison said that given the proposed legislation contains many reforms Elections Canada itself has suggested, he is confident they can get it done.